Home > 2015 > 06/29 > WIll You Play Hockey For Food? The summer has quietly arrived. The weather is nice, people are looking for things to do, and unfortunately, watching hockey isn’t one of their options. We’ve got lots of offseason stuff to talk about, but no games to watch. Of course, that’s a first world problem; there are much more unfortunate things out there – such as the thousands of Canadian families who aren’t able to afford to eat, especially in the months after holiday donations dry up. Enter Five Hole For Food; an organization that aims to solve the latter via a solution for the former. 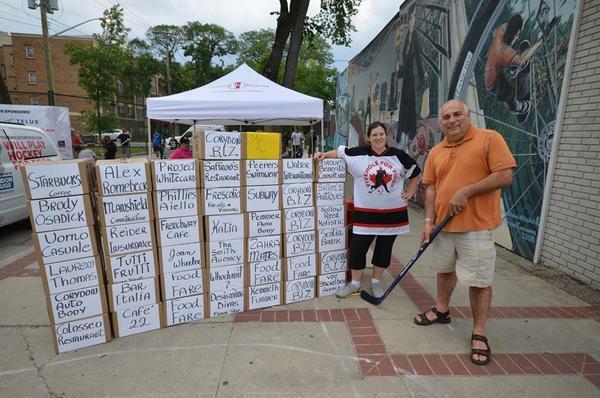 Five Hole For Food is a non-profit organization that attempts to get food in the hands of Canadians in need, using the passion for our national pasttime as a method for driving awarenss and fundraising. Founded in 2010, the organization has raised over a million pounds of food to date. The biggest component of the organization’s efforts is its annual road trip. Every year, a few members of the organization hop into a vechicle and drive from coast to coast, stopping in major cities to host ball hockey games. Set up to operate with both teams and drop-in players, the only barrier to entry is a donation of food and/or money. Said donations then go to a selected food bank in the city hosting the event, as the team moves on to the next city. This year, the road crew will be stopping in thirteen cities over the course of eighteen days. It wouldn’t be a trip across Canada without stopping in Winnipeg, would it? Once again, the tour is coming through the city that Katy Perry built, and this time, it’s got a whole new venue! We’ll be playing over at Royal Sports. Last year, the game was hammered by a heavy rain storm, but we played through it. Here’s hoping for better skies this time, so people can show off their best moves!. The fun begins at 12PM on July 11th. We’ll be playing until 4PM. If you want to reserve a timeslot to play in, or have a group of friends that you would like to play with on a team, you can register here. Otherwise, you can just come with a hockey stick, a donation, and a lot of excitement on the day of the event. If you’d like to help out by inviting your friends, there’s a nifty Facebook Event as well. If you can’t make it to any of the events, that’s fine! You can make a donation on the FHFF website, or alternatively, buy a “Will Play Hockey For Food” t-shirt from the same link. As well, offline donations can be made via our coin drive at 7-Eleven locations across the country, or in the form of food in various London Drugs locations across the west coast. You can also follow Five Hole For Food on Facebook, Instagram, and Twitter for updates on how the tour is going, along with the official blog. If you’re curious about anything at all rearding the tour, don’t hesitate to send me a DM on Twitter, or even send me an email. I’m helping with Social Media again this year, and as such will be on the road team, so I can answer all your questions/concerns, or at least forward them on to someone who would have a better answer. Beyond that, it would be super fantastic to see some new and familiar faces at the events this year! Any bit of extra hype helps, so don’t hesittate to tell your friends and family, or even give us a shoutout on whatever form of social media you use.